At The Fat Plant Society, we have been doing some research that extends beyond our existing knowledge on living walls and green installation options for public spaces. We’ve been contacting design and architectural professionals both online and in person to pose questions regarding how to best interact with architects, design professionals, and others involved in the design of public spaces. We have been doing this for a couple of reasons. Firstly, we like to think of ourselves as polite and considerate people and rather than go barging into a firm either virtually or in person, we feel it is considerate to learn more about the protocols and preferred methods of communication in a given industry. We also like to learn and while we are not likely to become “cad-monkeys” (meant with love and to seem cool, not to be derogatory in any way) we do understand AutoCAD and Revit and the wondrous and beautiful world of architecture and design. And not to brag or anything, but we’ve been on more than one public building project committee and talk to our construction and engineering friends often about how to best learn and communicate with all the cool kids (also meant with love and admiration) who build and design amazing buildings such as hotels and libraries and other and public spaces. Green installation: Moss wall installed within a slate tile frame (recessed frame). We define “public spaces” as those that see a great deal of traffic throughout a given day (like hundreds of people) and we asked a number of questions in our qualitative research about what architects and designers are looking for in design elements for public spaces such as restaurants, hotel lobbies, airports, and public buildings (like libraries, of which we are particularly fond). Two of the most important factors for architects and designers in selecting green elements for public spaces are cost and maintenance. Additionally, the options most commonly referred to in our discussions with folks in architecture and design were living walls and vertical gardens. 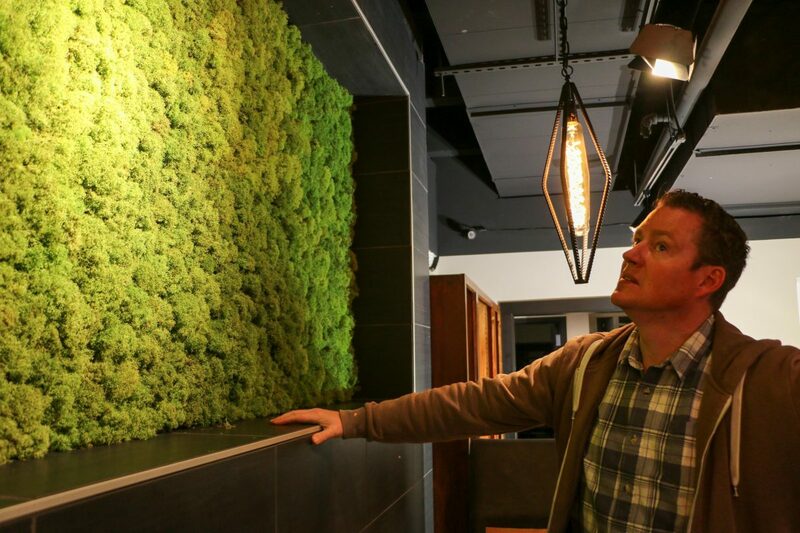 We love living walls and vertical gardens and we’re delighted to share this fantastic post by Matt Alderton featuring 5 Midwest Hotels with Living Walls because there are some truly stunning living wall installations here in the Midwest. To that end, let’s take a closer look at the difference between a living wall and a moss wall. Eco Warrior Princess broke down living walls and vertical gardens really well in her post. She writes, “A living wall consists of successive panels of plants which grow vertically, sometimes using the principle of hydroponics. Hydroponics is soil-free gardening. Within a hydroponic system, plants receive the nutrients necessary for photosynthesis directly through their water source. Hydroponic systems self-water through hidden pipes in either a drip-down or circulatory fashion. Water tanks require routine refilling when dry. So the bottom line is that living walls and vertical gardens need water–either through an installed watering system or by hand. We applaud Eco Warrior Princess for touting the benefits of nature and natural elements. As she notes, one of the best reasons to implement a green element (in addition to their beauty) is because “Numerous studies report positive physical, mental and emotional benefits associated with direct exposure to nature.” In fact, we’ve been watching In Search of Balance, a 2016 documentary that explores a new paradigm of health, science, and medicine, based on the interconnections between us and nature. Among the many interesting points, we especially loved the idea that the more the consumer is connected to nature, the happier they are–and the consumer in the public space is the hotel guest, the library patron, the employees who spend much of their lives in that space. We also believe that there should be a green installation solution for every budget. The Fat Plant Society is anything but a “one size fits all” organization and one of the first questions we ask of our clients is what their budget is in both money and time. Maintenance (whether outsourced or handled in-house) is an expense and we like to look down the road at least one year after the installation and determine the best option for the client’s capacity to not only implement but also maintain a green, plant-based installation. Thus enters another, viable option for a green wall that requires less maintenance and no water. The moss wall. While the moss is preserved, it is still as lush and green as it was the day it was cut from the forest (we source our moss from Kentucky and North Carolina) and even smells like the forest. The paraffin preservation process keeps the moss green for more than ten years. The moss is essentially dormant, stopped in time, and for our installations, we intentionally leave the acorns, leaves, and small bits of beauty that made the journey with the moss from Kentucky and North Carolina to Kansas City. Moss walls are virtually zero maintenance (they may require occasional dusting using compressed air like you would use on a computer keyboard but that’s it). Moss wall installations are far less complex and weigh next to nothing as the moss is applied to light foam core or wood that is feather-light. For example, a 2-foot by 4-foot frame weighs less than 10 lbs. And when installed at the size of a full wall, it is even lighter. Cool, huh? Moss walls come in at around 1/3 to 1/2 of the cost of a living wall because they do not require a complex watering system and do not need watering or misting. Ever. Moss walls and frames provide a wonderful dampening effect to the acoustics in public spaces. Essentially, moss elements remove the echo and the sound that can bounce off of walls and exposed/open ceilings. In fact, we are currently working with a restaurant that has a need for green elements and improved acoustics and we will be suspending large, moss frames from the ceiling which was our solution to meet them at their budget rather than exceed their budget by insisting that the entire ceiling be covered in moss (though that is equally beautiful). Misako Inaoka Installation in Japan. This installation by artist Misako Inaoka of Japan is a stunning example of what moss can do to improve not only the look of a ceiling but improve the acoustics and feel of a space as well. While green walls and moss installation are fairly new to the Midwest, they’re becoming a hallmark for guest-focused and coworking, co-living, and social space developers. Take The Assemblage, they are launching a second location in New York’s Financial District—in addition to five floors of co-working space, The Assemblage will be adding a 79-room hotel (the concept first debuted in New York’s NoMad District) and a moss installation will welcome guests as it stretches across the entryway ceilings and walls. Like I mentioned, we have been doing some research and we have learned a great deal. We’d like to thank all of the architects, designers, directors, and librarians who have helped us to enhance our knowledge and understanding of how to best communicate with them (throughout the project) and their consumers (through our designs and installations). We appreciate the opportunity to learn and we welcome any and all inquiries regarding how The Fat Plant Society may be able to enhance a public space through moss walls, succulents, and other lower cost, low maintenance, sustainable options.